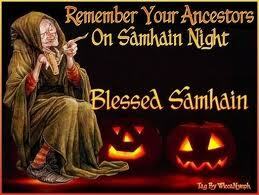 Merry Samhain evening my friends! It’s here….the night Witches wait for all year long…The most magickal, spell-binding, veil-walking night of the Year….Samhain! The weather here fits the night! Gloomy, drizzly, windy and cold! A perfect night for a fire, lit candles, warm food on the stove or in the oven, and a nice glass of belly warming wine..or two. I’ve had the feeling for a while….you know what feeling I’m talking about. Some say “like someone is walking on my grave.” That tingly, sure feeling you get..that knowing that someone is with you…not of this world. Tonight, the veil opens all the way. To allow our ancestors to be with us….to converse, teach, guide and to just share love with us. All we have to do is quiet ourselves, breathe…..and listen! A place will be set at my dinner table for any guest from the other side who cares to join us. I have smudged the house, swept out the old and negative and left room for the positive for the New Year. I feel content and Blessed and ready for all the exciting things coming my way for my family, friends and I. I hope you all feel the same! So raise a glass on this night of Samhain, the Witch’s New Year….this magickal night of Nights and send Thanks and Love to the Goddess for the blessings of the past and the blessings yet to come. Have a very Blessed Night! as we celebrate the cycle of death and rebirth. the lines between worlds are thin and frail. I don’t fear you and you don’t fear me. my ancestors watch over me as I rest. on the night of Samhain, the Witch’s New Year. Sources….Poem was in my BOS and I’m afraid I don’t know who wrote it. 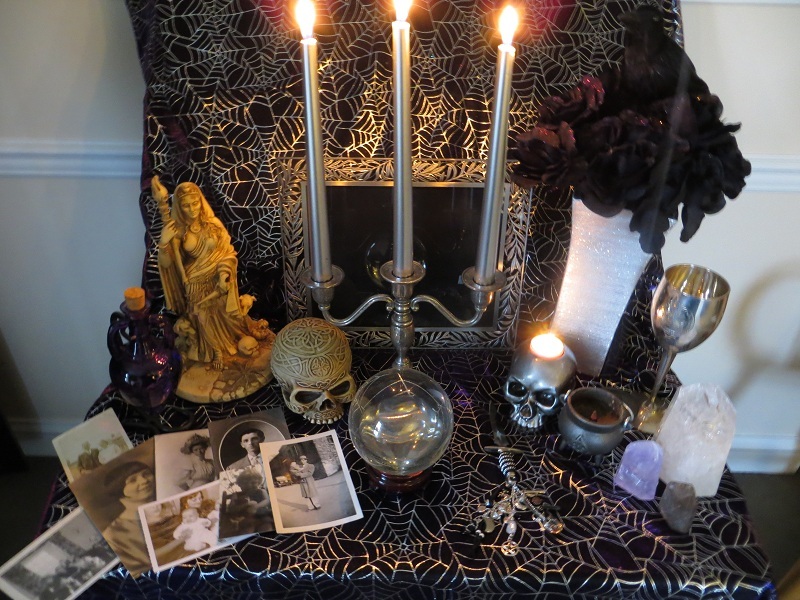 Altar pic is my own. We had a gorgeous day! Woke up to thick fog, the red leaves on the trees had an eerie glow. Eventually the Sun came up and burned off the fog and we now have beautiful blue skies, an early Moonrise, and a bit of a breeze. Leaves are lazily blowing here and there, birds bathing in the pond and feeding at the feeders and a deer walked across our yard a bit ago…enjoying the weather too. A day to remember and enjoy! Now for those recipes…I have been perusing the Fall magazines and my cookbooks and came up with a few I thought you all would enjoy. So here we go! *I love the citrus and maple flavors of this cider! In a large pot over medium heat, melt butter. Add potato and onion and cook, stirring occasionally, until onion is translucent, about 8 mins. Add chicken broth and bring to a boil. Cover, reduce heat to low, and cook until potato is tender, 10 to 12 mins. Stir in pumpkin. Using an immersion blender, puree mixture until smooth. (You can use a blender too) Stir in 1/2 tsp salt, 1/8 tsp pepper and nutmeg. Increase heat to medium-high and bring mixture to a boil. cover, reduce heat to low, and cook for 10 mins. Stir in cream and heat thoroughly. Season with salt and pepper to taste. Serve hot. 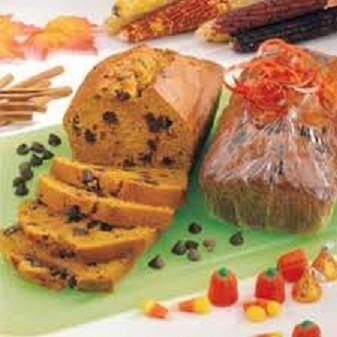 Preheat oven to 400* Peel and seed squash, cut into 3/4 inch cubes. Toss together squash, olive oil, honey, salt and pepper in a large bowl. Place in a single layer in a lightly greased, foil lined jelly roll pan. Bake 20-25 mins until squash is tender, stirring once halfway thru. Remove from oven and cool in pan for 10-15 mins. Meanwhile, pulse poppy seed dressing and cranberries in a blender 3-4 times or until cranberries are coarsely chopped. This will be your dressing. 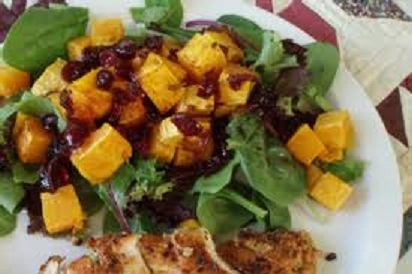 Toss together squash, salad greens, goat cheese, bacon and pecans in a large serving platter. Serve with dressing. Combine herbs, salt and pepper; rub over roast. Cover and refrigerate for several hours or overnight. Bake, uncovered, at 325° for 1-1/2 hours. Drain fat. 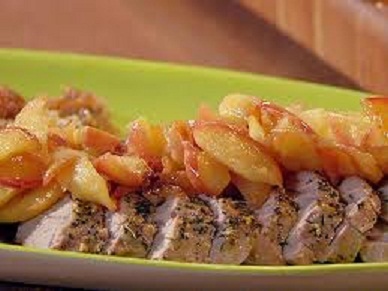 Mix apples and onion with brown sugar; spoon around roast. Continue to roast 1 hour or until meat thermometer reads 160°-170°. Transfer the roast, apples and onion to a serving platter and keep warm. Skim excess fat from meat juices; pour into a heavy skillet (or leave in the roasting pan if it can be heated on stove top). Add apple juice and syrup. Cook and stir over medium-high heat until liquid has been reduced by half, about 1 cup. Slice roast and serve with gravy. Place sweet potatoes in a large saucepan or Dutch oven and cover with water. Bring to a boil; cover and cook for 30-45 minutes or until tender. Drain. When cool enough to handle, peel and slice potatoes. •Place apples in a large saucepan and cover with water. Cover and cook over medium heat for 7-8 minutes or until crisp-tender; drain. 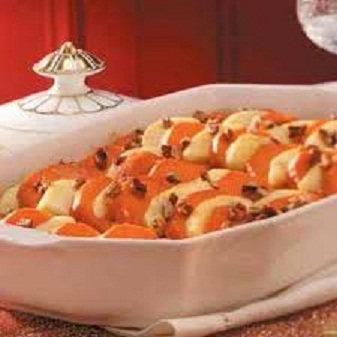 Place apples and sweet potatoes in a greased 2-1/2-qt. baking dish. 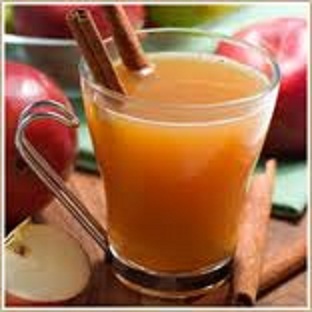 In a small saucepan, combine apple juice concentrate, 1-1/2 cups water, sugars and salt. Combine cornstarch with remaining water until smooth; gradually stir into apple juice concentrate mixture. Bring to a boil; cook and stir for 2 minutes or until thickened and bubbly. Remove from the heat; stir in butter until melted. Pour over potato mixture. Bake, uncovered, at 325° for 30-35 minutes or until heated through. In a large bowl, combine the flour, oats, brown sugar and baking soda; cut in 1 cup plus 2 tablespoons butter until mixture resembles coarse crumbs. Set aside 2 cups for topping. Press remaining crumbs into a greased 13-in. x 9-in. baking dish. Arrange apples over top; set aside. In a saucepan, combine the sugar, cornstarch, water, vanilla and remaining butter. Bring to a boil. 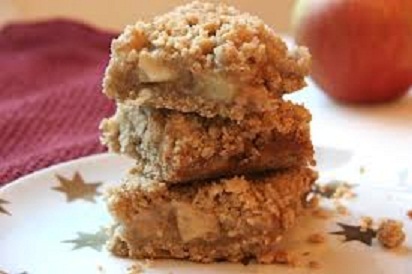 Cook and stir for 2 minutes or until thick and bubbly; spread over apples. Sprinkle with reserved crumbs. Bake at 350° for 35-45 minutes or until top is lightly browned. I hope you enjoy them, try them. Let me know if you do! Well, my dinner is ready and I want to start a fire. The Sun is setting on a beautiful evening. Nightmare Before Christmas just came on and I want to watch it with my daughter. 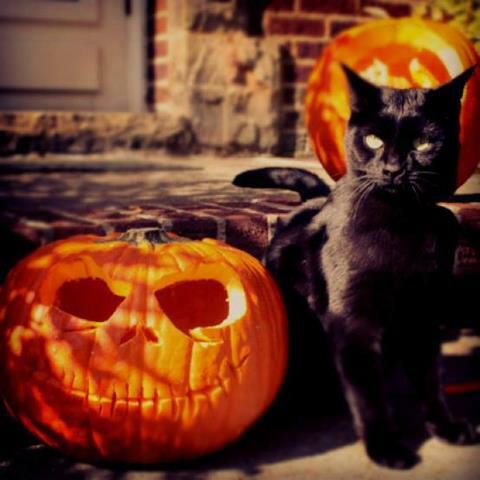 “This is Halloween This is Halloween! : :)) I wish you all a Blessed Night! Sources: Recipes from my kitchen, Southern Living and Country Living magazines. Thrill in the glory of each day. Merry Meet my friends! Happy October!!! October..what a beautiful Month..my favorite..as those of you who know me..know 🙂 October..the Season of the Witch!! It was a wonderful Mabon at my house and the Harvest Moon has been Full, and bright and big and filled with energy and magick! Tonight is the first night I haven’t been able to see Her…it has been raining gently for a few hours now. A lovely Autumn rain! I’m sitting in my favorite chair..a glass of Witch’s Brew spiced wine in my hand, a fire in the fireplace, listening to music and relaxing. 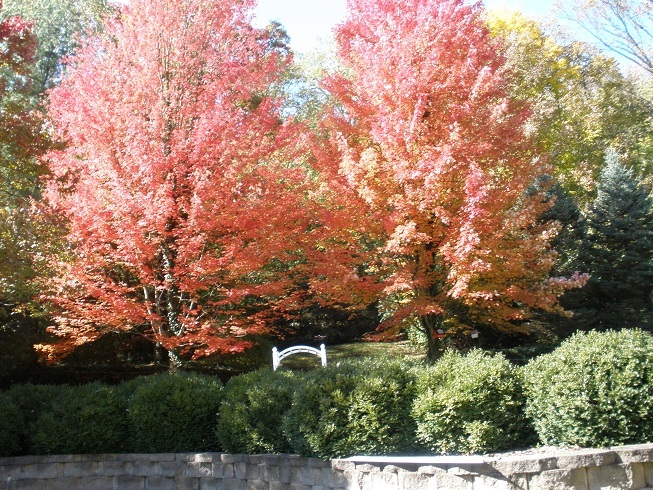 I am in Bliss with the fact that my favorite time of year is here…Autumn…in all her splendor. October…immediately brings to mind woodsmoke and fires, crisp air nights and blue sky days, mums, pumpkins and the last of our garden’s bounty, sweaters, colorful leaves falling in brisk, cool air. Birds flocking and critters gathering, apple pickin and eatin and bakin, warm spiced cider, raking and burning leaves, black cats and ghostie spirits and trick or treats. Halloween parties, Ancestor altars, and Dumb Suppers. I could go on and on with the things that bring me great Joy this time of year! 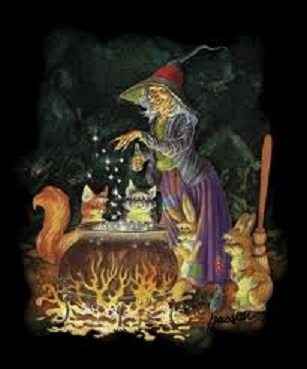 My Witchy friends are all happy right along with me.…planning for the Witch’s greatest night of the Year….Samhain! Our New Year!! 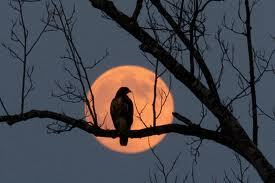 A Most glorious, wondrous, magickal, mysterious Night! I can’t wait!!! I look forward to sharing this wonderful Season with you all! 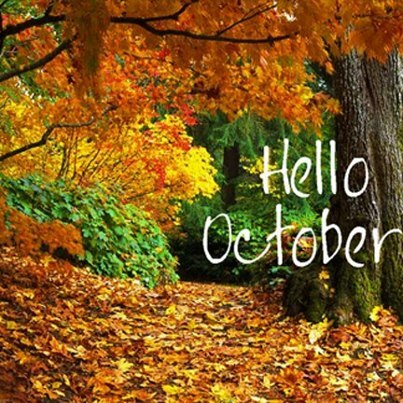 Blessings for a beautiful Fall!! !